Okay, this book came with a lot of recommendations and praise. Though, I didn’t go in expecting much. 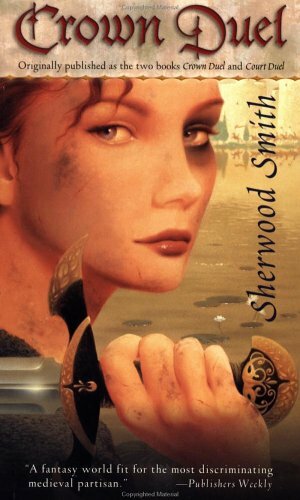 It seemed to me that it was just kind of another one of those “give a girl a sword” books, which I have absolutely nothing against (I LOVE Tamora Peirce for her “give a girl a sword” books. ), and it was. I didn’t find anything special about Meliara’s story. I predicted the ending from the beginning. I felt like I had read the story before. But I liked it. Similar to what I thought of Pillage: it was a good story, but it was nothing new. Now, for the second book/part two, I was less pleased. It was certainly not as cliché as the first book/part, but it was less…driven. It didn’t really seem to have a plot until the last 50 pages. I liked the story in the preceding pages, but it didn’t really carry me along. Because I already was pretty sure I knew the answers to all the “mystery” presented in that part of the book. In my version, there is included an unpublished short story that continues the story of Meliara. I really liked this story, it was probably my favorite part of the whole book. I thought it showed the personality of the characters very well, and I finally felt the love between Meliara and her love-interest, which I hadn’t felt in the book. It wasn’t unique, but I liked it. It brought me back into my reading swing (again), and for that, I’m grateful. 0 Response to "Crown (and Court) Duel--Sherwood Smith"